As I was sipping my coffee at Prahran Market this morning it suddenly dawned on me what day it was. As I started the mental arithmetic I realised it was indeed something to celebrate. The problem would be finding some place special at the last minute on a Friday Night. Perhaps there is something very special about this number as my long shot came through and I managed to get a booking at Interlude. 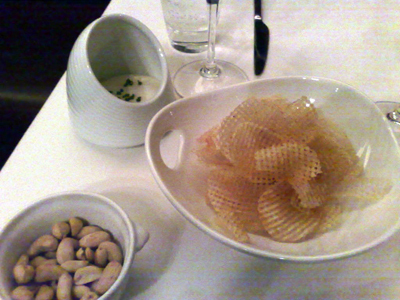 nibbled on the malt vinegar chips with salt and vinegar dipping foam and beer-flavoured nuts. 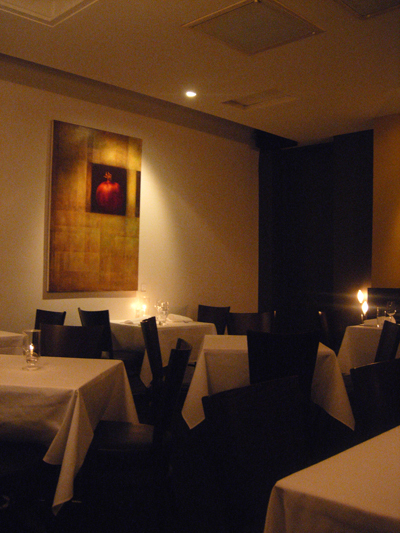 It didn't take us long to decide on the Chef's Dégustation with matching wines. 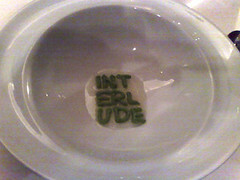 This is the dish we enjoyed during Monday's dinner but now you can see it a lot better! 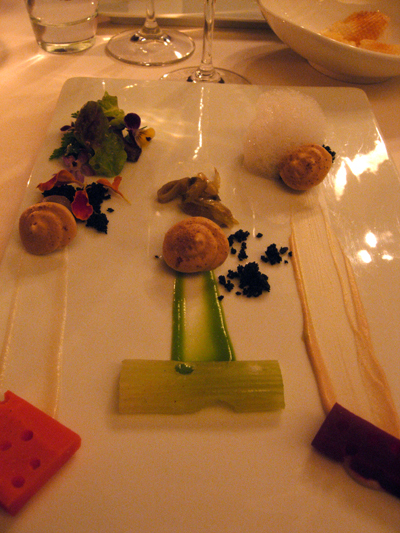 On their journey along the plate the snails have nibbled on the vegetables in their path. The sauce trails, from left to right, are garlic, parsley and butter - I especially enjoy the garlic sauce. The mushroom meringue shells are especially light and soft, almost disappearing in the heat of your mouth. The snail at the right has run head long into mushroom air while the middle is just short of meeting a little pickled vegetables. 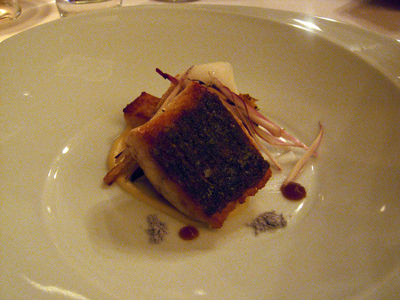 The pan-seared mulloway sits atop a rectangle of chicory sponge cake and is accompanied by caramelised chicory and sticks of treviso radicchio (?) 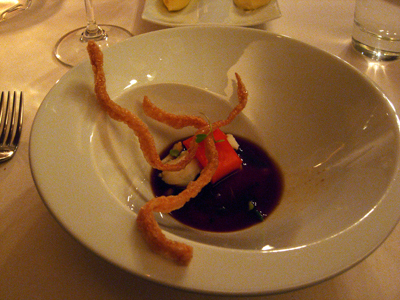 - violet dust brings a pleasant perfume to the dish. The fish is very moist and pleasantly earthy and breaks into large soft flakes. Hiding under the mulloway is a half-seared scallop. This is a new dish and one in which we were asked to give our opinion on. Paalo and I disagreed on one thing and that was the intensity of the Eucalyptus foam - I thought it was a little overpowering whereas he thought it was just right. 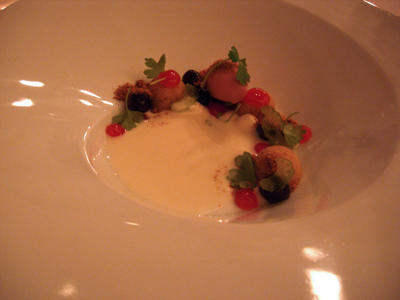 We both agreed that this was the best sweetbread we'd tasted. 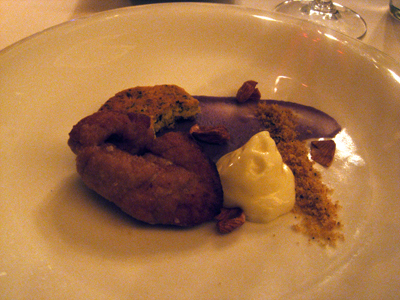 The dish itself was quite sweet - caramelised almond skins and the rosemary cookie but it was fascinating to see how well these flavours combined with the sweetbread itself. It's surprises like this that makes going out all the more interesting. 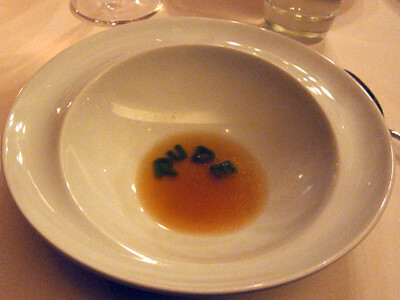 4 litres of lobster stock is reduced to just 750ml - I need not explain just how wonderful this consomme was. 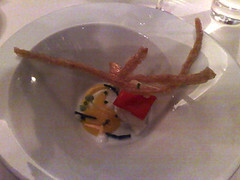 It is served with lobster crackers - and that orange parcel resting on the lobster pieces is a coconut jelly filled carrot raviolo - the carrot skin is itself is an ultra thin jelly sheet. I don't know why it is but you can be guaranteed that grown men will behave like 9 year old boys when offered this dish - Paalo excluded. 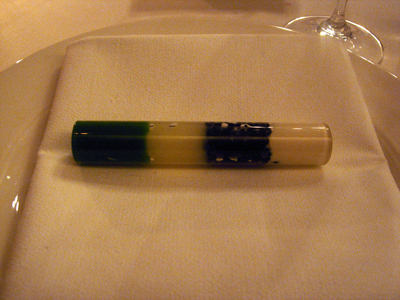 Inside the tube from right to left is cauliflower puree, caviar, apple sauce and chervil jelly and you simply inhale from the cauliflower end. It's a faux egg and it's filled with what I can describe as roasted chicken juices - cut the white and the juices run out like a perfectly soft poached egg. The chicken ball is simply chicken breast - shaped in this manner to facilitate even cooking and it is served with black pudding puree - the puree is like a thick, spicy gravy, delicious with the chicken. I can't tell you how much I love these slow cooked eggs and all that's missing are chunky toast fingers to mop up that luscious yolk. 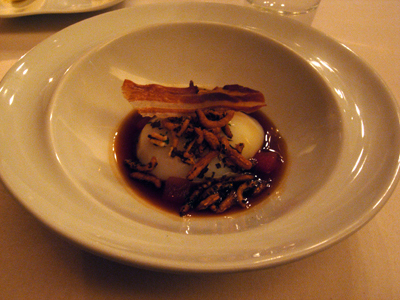 The eggs are served in a bacon broth with puffed wild rice and a wafer thin slice of crisp bacon. 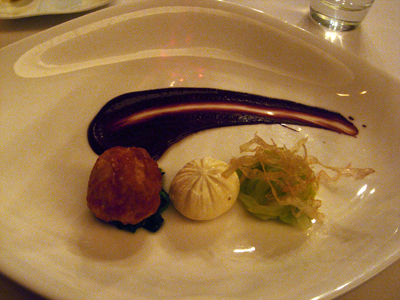 Stuffed inside the cylinder of potato croquette was braised oxtail - the paler dots on the plate are horseradish cream. 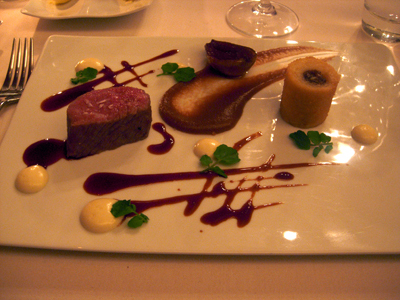 Wagyu was I think 8+ marble score and a pleasure to eat - the roasted onion puree providing the thread to pull the dish together. 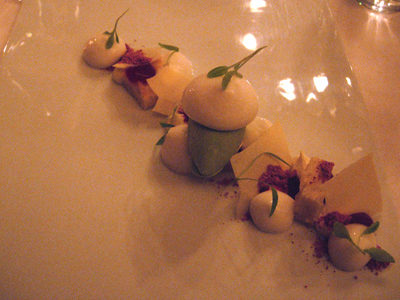 Almond milk, Almond Financiers, Rhubarb Jelly, sliced celery and coriander leaves. A very pleasant way to begin the transition from savoury to sweet. 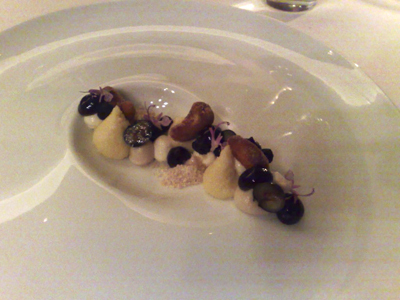 Halved blueberries intertwined with Semolina Cream, roasted Cashews and Muscovado sugar. 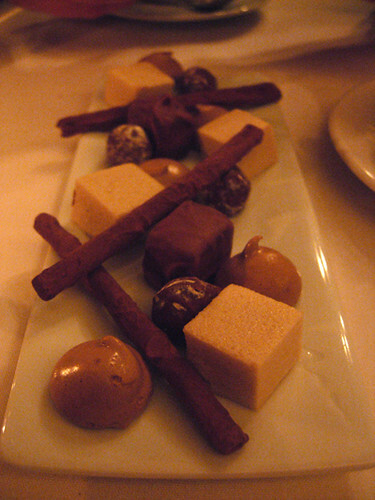 At the centre, reduced milk ice-cream and on each side a mix of date pudding and ginger beer jelly. Topped with rapadura sugar and crushed chocolate biscuits. 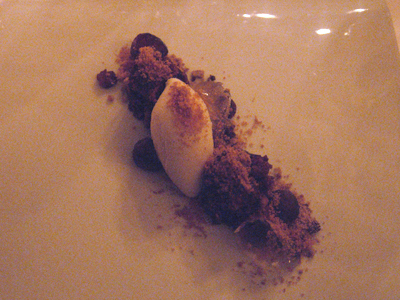 To end the meal, a dish with light and refreshing flavours - the mint ice cream works as a cleanser. A fascinating meal in which it's almost impossible to pick a favourite - the pacing was spot on giving you enough time to enjoy both the food and wine and chat. The service is also attentive without being intrusive. To finish, we are given the menu to take home - that is a very nice touch and we are treated to another sampling of Pierre's Chocolate and Coconut Pudding. If you want to see how the pudding turns out look here.